It's fair to say that we had an inauspicious start to our trip to the Outer Hebrides. An hour's drive up the road to Scotland, I stopped the car at a red traffic light on a busy roundabout on the outskirts of Stoke on Trent. The Yodel van behind me did not spot the traffic lights and did not stop. I had one of those slow-motion rear view mirror moments; I heard the wheels lock, realised that we were about to be hit, knew there was nothing I could do about it except let the brake go and hope it didn't hurt too much. A short verbal altercation ensued ( "What are you playing at, you can't just stop"...."No, mate, what are you playing at- can't you see the RED traffic lights?"). We exchanged details. We pulled off the roundabout, worrying about how well the dropping mechanism on the bike rack would hold up post impact, and whether our bikes had been damaged. We got very lucky. The impact was low, so the bikes didn't have even a scratch. The bike rack picked up a crack to the light cluster. We worried about the locking mechanism, which seemed bent, but gave it a very hard shove and confirmed it was still securely in place. And that was that- no injuries. Tom took over driving duties, and we set off for a second attempt to reach the Premier Inn in Dumbarton for an overnight stay on our way to Oban. 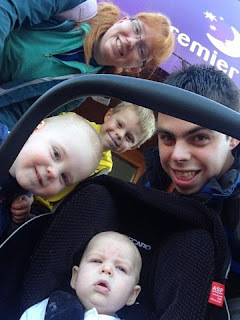 The children love the Premier Inn- we race Thomas to be the first to yell out "Premier Inn!" whenever we pass one, so with no expense spared, we checked in, charged up every electronic device we own and enjoyed the last wifi for a while!